So what matters more: Our personal experience? Or the conclusions of medical evidence? I suspect that most of my readers would say, the evidence. Hands down. And that is what most people believe… until they experience a bad outcome. That’s when things become more complicated. That single event can override all their knowledge. Everything they believed to be true. Suddenly all those statistics from the research come flying off the page. They are no longer just a number. They are now associated with a face… a baby… a parent. In that moment, it all changes. I have witnessed this countless times listening to professionals – especially doctors and nurses – talk about VBAC. You can hear the pain in their voice as they convey the story of a VBAC gone wrong. And you can see the fear in their eyes. The support they once felt in their heart – or the support they enjoyed from their hospital administration – slightly diminishes or vanishes entirely. 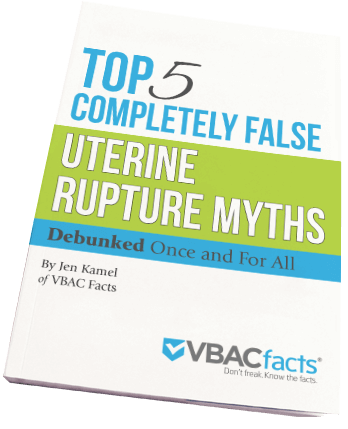 Uterine rupture, the complication that occurs about 1% of the time, that we know is a risk of VBAC, actually happened and everyone does an about face. I’ve seen providers no longer attend VBACs and hospitals “ban” them… based on one bad outcome. But the problem with this approach is that VBAC policies should be based on the facts and what is in the best interest of the public health. Otherwise we are constantly flip flopping between banning and supporting VBAC each time an uterine rupture or accreta occurs. That’s not good care. Most recently, a L&D nurse shared that she couldn’t support VBAC anymore after witnessing two uterine ruptures in two unmedicated VBACs over the course of six years. 1) Your story demonstrates that this is an issue that requires balanced, responsible counseling, because the risks involved are real. When you have an unusual or atypical experience, it colors your view of that issue. In your case, it may have increased your subjective perception of the magnitude of the risk of planned VBAC. You may subsequently pass that perception onto your patients when counseling them. This is why the data are so critical, so we can put our own personal experiences into perspective and maintain a rational, evidence-based rather than anecdotal, point of view. This is why it’s important for professionals to meld the beautiful births along with the bad outcomes within the context provided by medical research. This gives people who serve pregnant families a more well-rounded approach to birth… and helps them better guide parents as they navigate their options. We also need to consider how many VBACs with good outcomes that nurse witnessed because that is the overwhelming majority of her experiences… and yet, it is the bad outcomes that stick in her mind. That is human nature. That is a normal response. Especially if the birth or outcome was traumatic. But we must keep in mind the bigger picture if our goal is to provide our clients with the best care and service based on the evidence. Unfortunately, you can’t check your personal experiences against the conclusions of the medical literature if you don’t know what the research says. And that is where the challenge lies. Many professionals do not have the time to keep on top of the evidence. So while the bad outcomes stay close to their heart, the perspective of the evidence fades into the background. But we all know that’s not right. Plus hospital policy and professional pressure, which may spring from political, economic, or legal concerns, may impact their ability to practice even though they know that’s not providing the best care to families. Unfortunately, the politics of maternity care often impacts the care women receive… sometimes resulting in bad outcomes. The truth is how we collectively talk about VBAC – as well as policies – should be swayed more by the evidence, by the outcomes among thousands of parents, by national guidelines, rather than the perception of one person based on two bad outcomes. So how can we make that happen? The first step is to stay on top of the evidence and continually check our experiences against it. That is the only way we can ensure the conversations we have reflect the big picture while being honest and realistic about the bad outcomes that can happen. As long as dealing with the “non-factual” side of the event is lacking, experience will almost always trump any statistics. As long as there is little discussion and understanding around processing trauma and associated PTSD, an expectation to just pay attention to the data in making judgments and balanced recommendations or choices is only dealing with part of the issue and falls short. Expectations and beliefs are the hardest things to sway, especially in the face of a deeply traumatic experience. I believe looking at what makes someone able to provide “balanced, responsible counseling”, like wonderful Dr Chavira says, deserves more attention and thought. We may each of us never really be ready to experience bad outcomes when they happen, but maybe we can better establish selfcare tools and practices to attempt to be ready. Thank you for your words around this topic. I had an emergent cesarean section with my first child and in my mind that was my first failure as a mom. It took some of the joy out of caring for my newborn. I wish these nurses could have witnessed me trying to care for a newborn while battling C-section injury. The reality is that the aftermath is not coloring their perception. Sometimes it’s hard to go evidence based. Counseling can help. A uterine rupture is certainly frightening and potentially catastrophic. The probability of its happening is very low; once you introduce pitocin the uterus incision is challenged. I’m a RN, a VBAC mom x2 and teach OB. Sadly few moms opt for TOL so caring for laboring moms post CSection is infrequent. I never , not for one second, worried that my scar would rupture. Everything we do has a risk. Major abdominal surgery is fraught with risks as well. One year later and I am still in physical therapy and chronic pain. Sadly, at this point I do not trust the medical community.